Opal is one of my all time favorite gems. As valuable as ruby and emerald but worlds apart in appearance. Opals are an entity all there own, no other stone is quite like it. The indigenous Aboriginal people of Australia have a beautiful legend about how this mystical gem came to their land. The creator came down to Earth on a rainbow. This voyage was to bring the message of peace on earth to all humans. The very spot where his foot first touched down suddenly became alive, and the earth was glowing with all the colors of the rainbow. 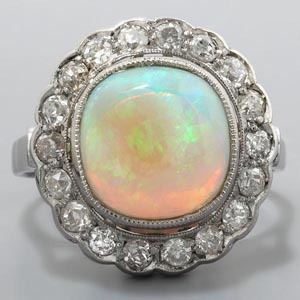 Millions of years ago when most of Australia was covered with a vast inland sea, opals were created within lava rock. A prehistoric combination of fine quartz rock [silica] and water is the basic recipe for this beauty. The water within the stone is what makes it’s appearance so distinct. 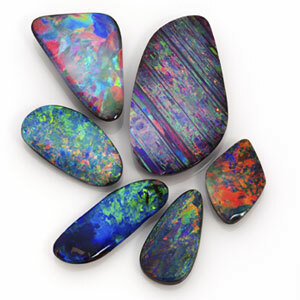 When opals are hit with light, the thin layers of fractured rock and water sends off a rainbow of colors.” Due to the high water content, about 6%, opals can become brittle and lose some of it’s flash and fire. 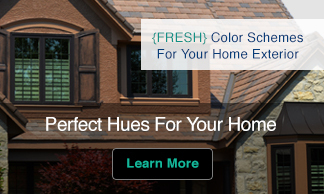 Dry climates and indoor heating are major culprits. The humidity in the air and moisture from your skin is what this gemstone loves. Good luck or bad luck? Historically it is one of the most controversial gem. For many centuries it was a highly revered stone. 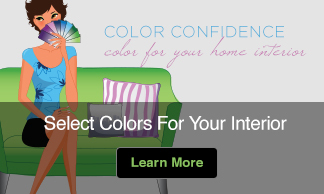 The ancient Greeks called it opallios, meaning “to see a change in color.” They believed it gave foresight and prophecy. Roman philosophers extolled about it’s beauty and it was thought to bring purity and hope. To the Arabs it was sacred and thought to make it’s ‘true’ owner invisible, it became a popular stone among thieves! Fair maidens wore it in their hair to protect it’s color. Opals first stroke of bad luck came during the Plague. People noticed that the stone’s ‘fire’ was brightest just before death. People saw it as an omen, that the stone was the cause rather than the symptom. Opal is very sensitive to heat, the high fever in the victim’s final days caused the luster of the stone to glow stronger. If this wasn’t bad enough, Sir Walter Scott’s novel about the fictional character Anne of Geierstein only made it worse. The stone was portrayed as evil, and changed color with her moods: red when she was angry, blue when sad, and green when happy, then fading to an ashen gray when she died. Superstitions were hard to shake. 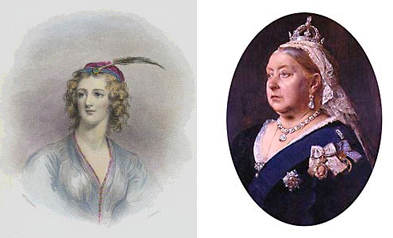 Only after Queen Victoria fell in love with their beauty did people consider wearing them again. She gave them as gifts to her children and soon after their popularity was on the rise again. 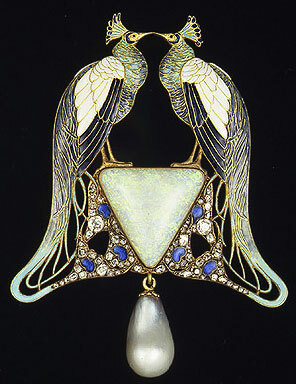 Later the subdued beauty of Deco jewelry showcased opal perfectly. It complimented enamel and were used together often in decorative pieces. Since, it has been used in countless designs. 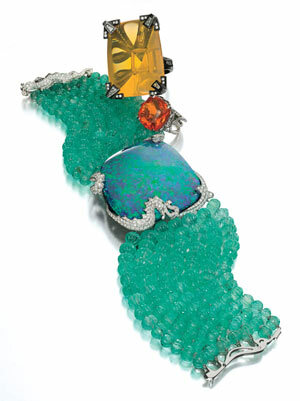 I am especially fond of Cartier’s emerald, opal and diamond bracelet featured in this months W magazine. Shakespeare described opal as the ‘queen of gems’, it made sense then and is true again today.